“I went to Dr. Doug when I found out that I had spondylosis and two worn out discs at the base of my spine. My back was so stiff and sore, especially in the mornings and I knew I had to do something about it before it got any worse. After only 12 sessions on the Spinal Decompression table, my low back pain subsided immensely. I still can’t believe how much it’s improved. I know there’s still more to go but, so far so good! I wish this type of therapy was available years ago. 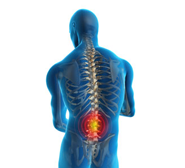 “I injured my back during a heavy lifting incident. I was eating painkillers everyday just so I could keep working. When my aunt told me about the Cork Spine & Disc Cener and the Spinal Decompression system, I was skeptical. I decided to follow through with the program that Dr. Doug recommended for me and I’m so happy it worked. I feel stronger and haven’t touched a painkiller since. I truly thought I was going to need surgery and now I’m back to work and back to playing soccer.